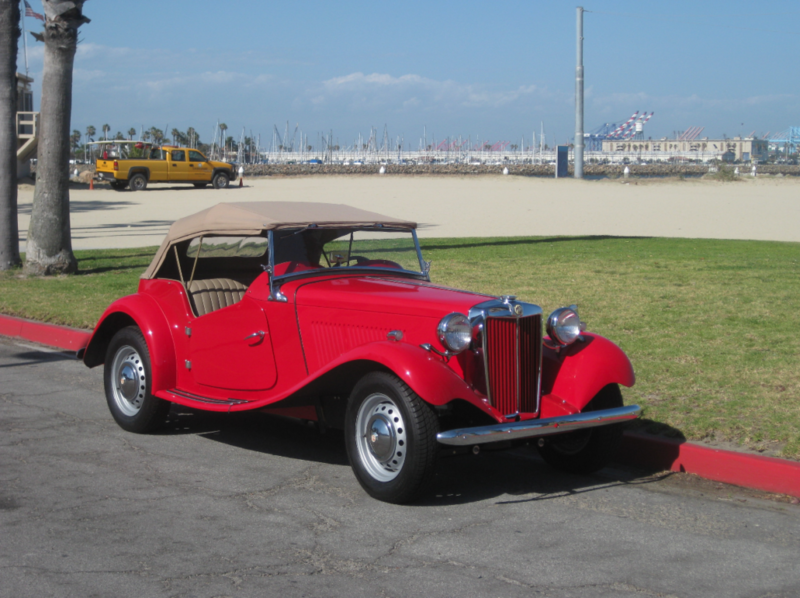 For your consideration an exquisite professionally restored 1952 MG TD. A California car that has undergone a complete nut and bolt restoration. This beauty is ready to enjoy. Purchased by the current owner as a father-son restoration project , the car has been fully renovated from top to bottom. The current owner has reluctantly decided to part ways with this very complete TD because he lives in an area where he cannot keep the car. Along with the professionally re-built engine it has had the very sensible 5 speed transmission upgrade, giving synchro first and the capability of freeway driving. The interior is a light tan that perfectly suits the beautiful red exterior. The exterior is in excellent condition. The high end paint job includes a coating that is no longer available in California due to EPA rules. The leather seats and trim are without wear. All interior/exterior electrical is in working condition as the car has had all new wiring throughout. The speedo, tachometer, amp, and temperature gauges all work. The ignition light and push horn are functioning as well. The indicators have a self cancelling vacuum switch and are in working order. The windshield is in great condition, very clear with no cracks. The wiper does not work, however this car won’t soon be driven through a torrential downpour seeing as it is lacks in the side curtains department. The wheels are in good shape and the tires are like new. 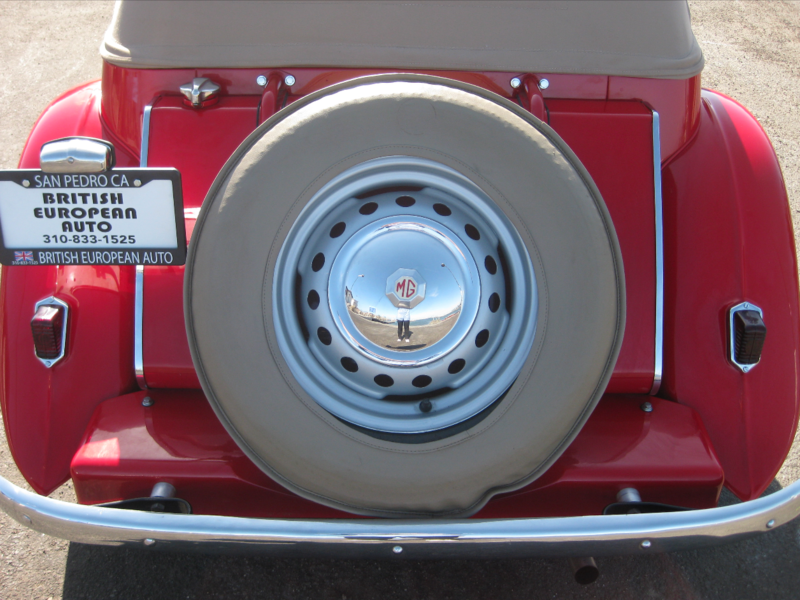 The TD also has a spare tire mounted to the rear which has a very smart wheel cover. The doors’ fit and gap is perfection and there is no paint chipping anywhere. Under the bonnet (that latches and fastens very well) it is immaculate. Yes, there are a few minor oil leaks, it’s an MG. In addition to a beautiful exterior and interior, a tasteful and very sensible restoration has made this sports car a joy to drive. Starting easily from cold on the choke, the engine runs smooth with good oil pressure and has a nice idle. Pulling away the clutch is smooth and the gearbox is exceptional in all gears with no noise or synchro issues. The suspension is in superb condition and the ride is not bumpy in the slightest. There is no unwanted vibration through the steering and the drive is very smooth. The brakes are firm and the car pulls up straight upon braking. 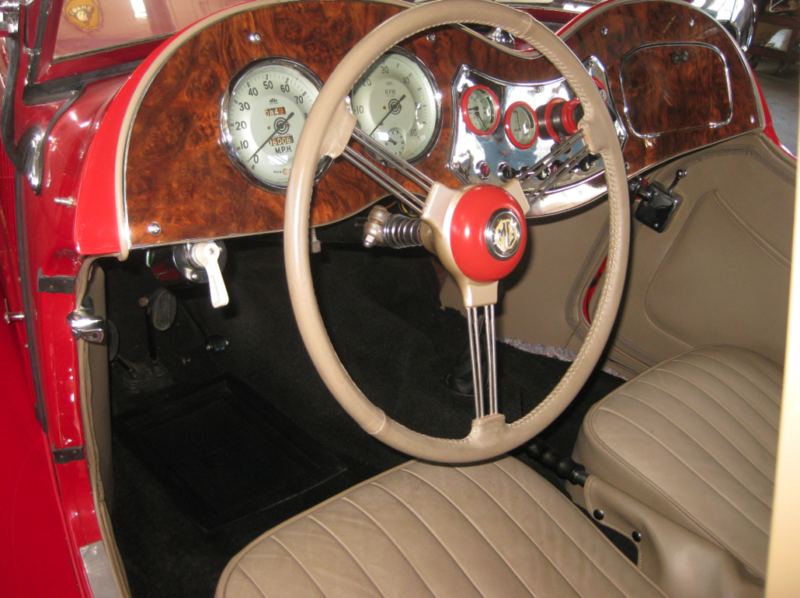 You can be rest assured that this MG TD has been fully restored by professionals that took the time to do things right, and maintain the integrity of the car. No bolt has been left unturned and no corners have been cut in this refurbishment, making this TD extremely drivable and overall a mechanically sound sports car. Although produced in 1952, the modifications to the gearbox really do make such a difference in the way this car drives and allows the ride to be much more enjoyable in today’s hustle and bustle of traffic. This car is an outstanding example of a restored MG TD that is fully sorted and a joy to drive. If you have any questions please feel free to ask. As always we would recommend driving and viewing the car if at all possible. Please call (310) 833-1525 for an appointment.